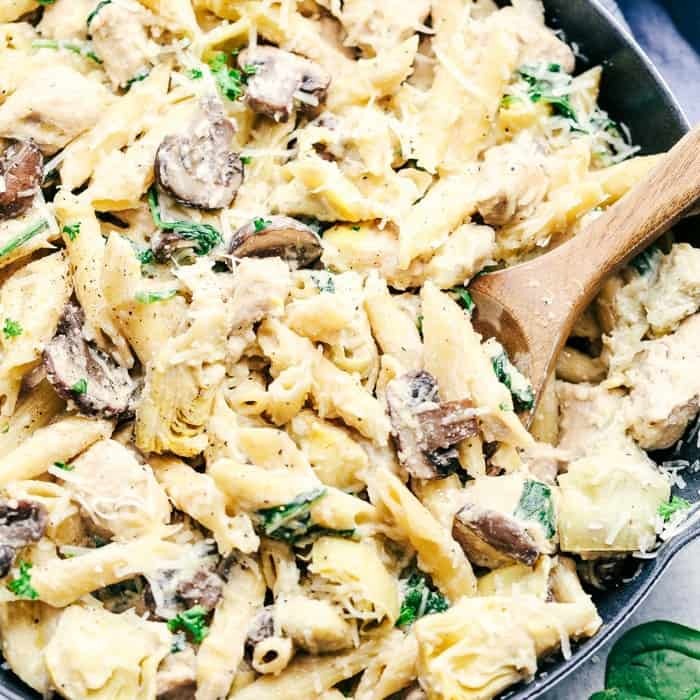 One Pan Creamy Spinach Mushroom Artichoke Chicken requires only one pot and 30 minutes to bring you an incredible creamy and delicious meal! You guys. 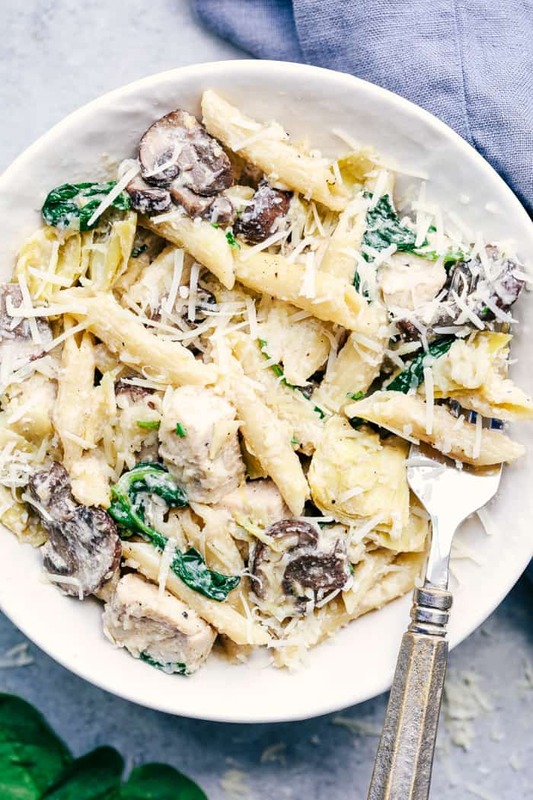 Once I made this one pot creamy chicken mushroom florentine I was hooked. Ain’t nobody got time for dishes… am I right?? Especially lately for us. I am just doing what I can to survive the end of this pregnancy trying to keep it all together and make sure that my kiddos get fed. We did have our last Lacrosse Games of the season yesterday. Hallelujah! So that should free up some of my time to keep the delicious one pot meals coming. 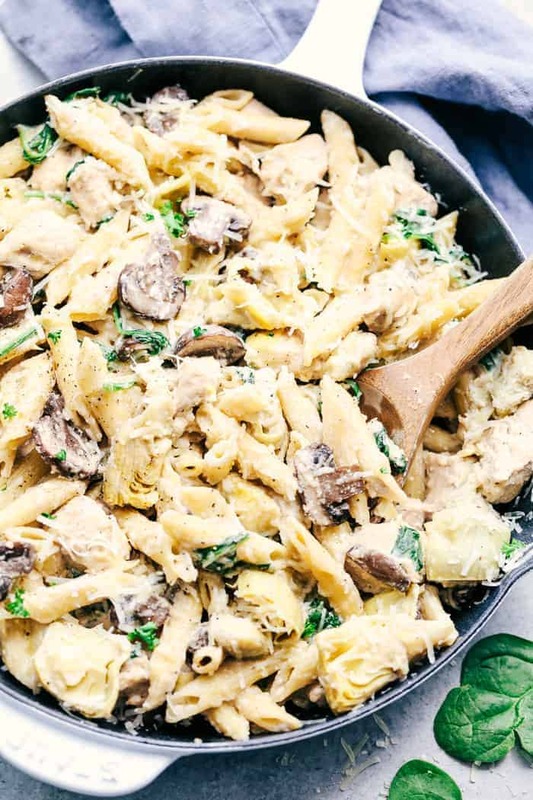 If you have not made a one pot meal right now, drop everything you are doing and go to the store and make this tonight! This meal was absolutely fantastic and I was reminded how much I love a one pot meal. Not only does it free up some time from doing a ton of dishes, but everything is cooked in the same pot. I used penne for this dish because for some reason my little two year old is obsessed with penne pasta. She couldn’t eat this meal fast enough! She kept asking for more. So if a two year old approves of this recipe…. just sayin’. 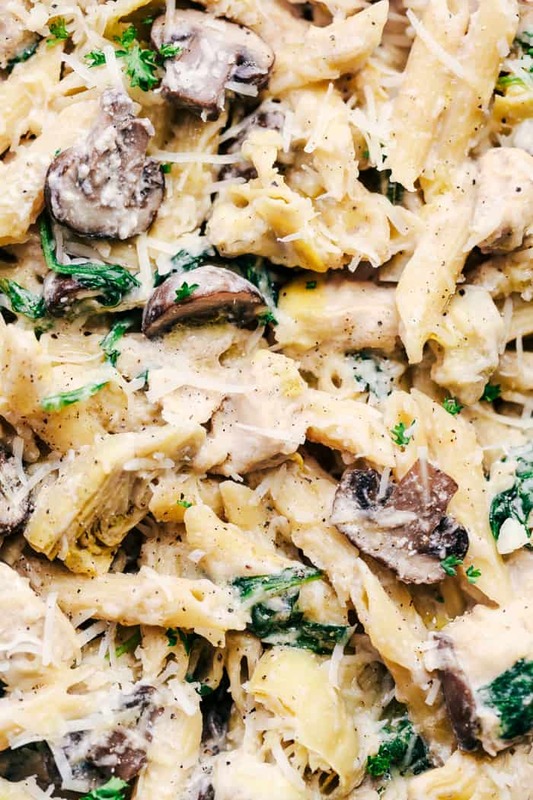 The creaminess + the spinach + artichokes + mushrooms + freshly grated parmesan is a recipe for success. We all loved it so much that I know you are going to love this one too! It is sure to become a favorite in your family. In a large skillet over medium high heat add the butter and cook the chicken until golden brown and no longer pink. Add the olive oil and cook the garlic, and mushrooms until tender. Add in the artichokes and flour and cook for another minute. Slowly add the chicken broth, half and half, salt, pepper, and garlic powder and whisk until incorporated. Add the penne and bring to a simmer. Cover and cook for 10-15 minutes or until the pasta is tender. Remove from the heat and parmesan cheese and spinach and stir until the spinach starts to wilt. Serve immediately. Holy yum, this is pretty much what I’ve been craving all day! I guess great foodie minds think alike ?. Can’t wait to try out this version! So yum!!! Thanks for all your good goodies!! Yes! I love seafood too!! I am not sure how it would taste but it sounds delicious! Let me know how it turns out!! Made it up tonight. I was not disappointed. It is delish. That is so great to hear!! I am glad you liked it! Thanks for sharing!! Really good recipe, thanks for the helpful write-up! Just made this with a few tweaks (used chicken tenders, ricotta instead of half and half, and broccoli instead of artichokes), but it came out great. I was nervous the liquid wouldn’t cook off, but it came out perfectly. My wife and I are fans! This was incredible! My family loved it! That is SO great to hear!! I am glad they loved it! Thanks for sharing!